The dissertation “The Power of Television: Including the Historicizing of the Live Romanian Revolution” by Dana Mustata’ will be available soon after her defense on Friday, February 4 at Utrecht University. Mustata also works for EUscreen as a researcher where she focuses on contextualisation and the use of online television content in academic research. Her dissertation is a first history of Romanian television, dealing for the first time with the history of television under a former communist regime. It shows that despite the oppressive regime, television was not necessarily and not always an instrument of political control. The dissertation develops an innovate method for understanding television in a coercive regime. The method studies television as an agent of power. 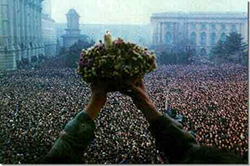 Based on this method, the dissertation reveals brand new data on the televised Romanian Revolution in 1989: the event was not a spontaneous public outburst, but a decade-long rehearsed process that took place in the private spaces of television viewers and which was silenced, controlled and manipulated by the Securitate, the former Romanian secret services. Being a first television history of a former communist country, the dissertation opens up this field of research in Eastern Europe, making a significant contribution to European television history. The dissertation is based on so far undisclosed and classified documents of the Romanian communist secret services.